ALBUQUERQUE - A Czechoslovakian Torah from the Czech Memorial Scroll Trust & Museum in London is on display at the Holocaust & Intolerance Museum of New Mexico as part of an educational initiative promoting peace. In 1942, members of Prague’s Jewish community devised a way to bring the religious treasures from the deserted provincial communities to the comparative safety of Prague. The Nazis were persuaded to accept this plan and more than 100,000 items were sent to the Central Jewish Museum in Prague. Among them were hundreds of Torah Scrolls. Each was meticulously recorded on a card index by the museum’s staff with a description of the Scroll and the place from which it came. Now the only Scrolls available for distribution are those that are returned for a variety of reasons. Congregation B’nai Israel in Albuquerque obtained its Torah several years ago and has agreed to lend it to Holocaust & Intolerance Museum of New Mexico. The Torah will be the centerpiece in a curriculum aimed at educating young people about the Holocaust and combating hatred. “This is a way to remind ourselves as to what happened,” said Congregation B’nai Israel President Harvey Buchalter. “This is a Torah that once served a congregation that is no more. We’ve reclaimed some part of Czech Jewry that goes back 2,000 years.” Museum official agree. 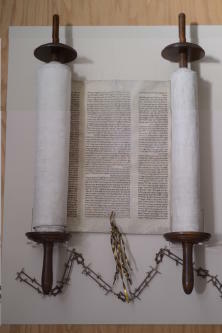 The Torah and curriculum will be available until April 2013 at the New Mexico Holocaust & Intolerance Museum at 616 Central Ave. SW, in Albuquerque. Museum hours are 11 a.m. – 3:30 p.m. Tue – Sat. For more information call (505) 247-0606, or visit www.nmholocaustmuseum.org. The Holocaust & Intolerance Museum of New Mexico is a beneficiary agency of the Jewish Federation of New Mexico.